Intravenous lipid emulsion (ILE) resuscitation is now frequently being used for severe overdoses due to lipophilic drugs. However, the optimal dose, duration, and safety are still unclear. A patient with refractory cardiovascular collapse following an amitriptyline overdose was treated with ILE with initial improvement. Instability recurred after ILE discontinuation and lipid therapy was restarted, but high-dose treatment was complicated by severe lipemia. A low-dose infusion was instead used, and the patient did not experience further toxicity despite amitriptyline levels in the toxic range for 21 days. He survived to discharge without long-term sequelae. A low-dose infusion of ILE was well tolerated and may have successfully prevented recurrent toxicity in a case of severe tricyclic antidepressant overdose. 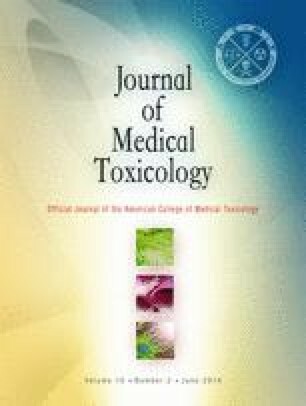 This work was previously presented in abstract at the 2012 North American Congress of Clinical Toxicology annual meeting, October 1–6, Las Vegas, NV (Clin Toxicol. 2012; 50(7):579).